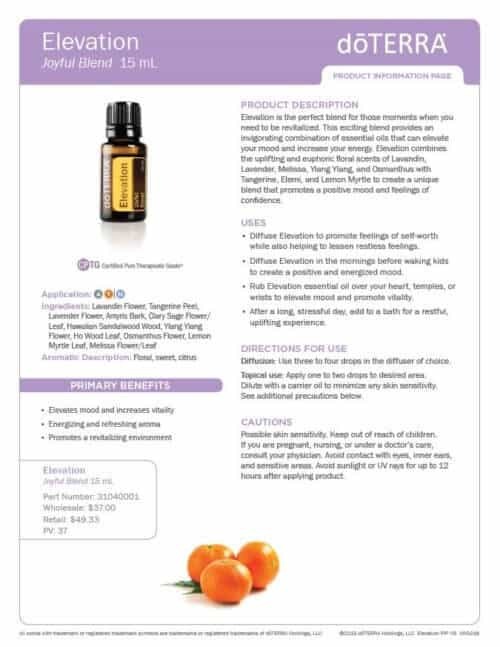 Here you can learn about doTERRA Elevation Joyful Blend Uses with recipes. 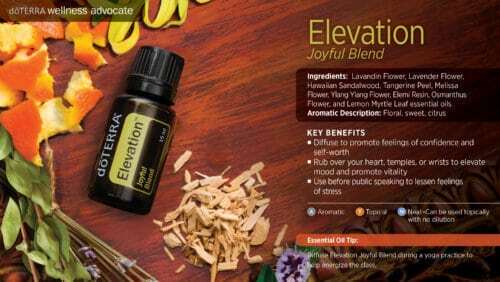 I explain all about doTERRA Elevation Joyful Blend Uses and all the ways you can use it and how to use it. Enriched with a combination of calming, grounding, and revitalizing essential oils, Elevation Joyful Blend is true to its name. This blend will help to uplift the mind and emotions to create a joyful and calming atmosphere. 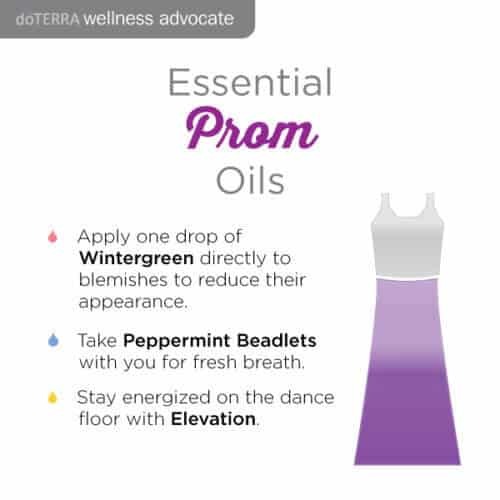 Elevation essential oil’s powerful benefits can be obtained aromatically and topically. When diffused, this sweet floral and citrus blend can help lessen feelings of stress while emitting an energizing and refreshing aroma. 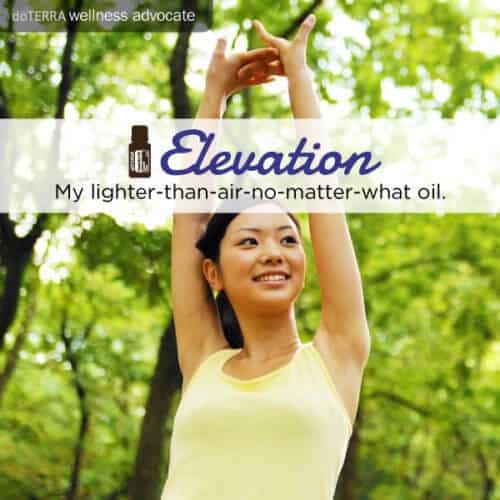 Elevation can also be used topically to promote vitality, confidence, and a positive mood. Because Elevation blend is composed of vitalizing and uplifting essential oils, it is a perfect blend to use when feeling sad. When you start to feel negative emotions arise, use Elevation topically or aromatically. This blend will help elevate mood and increase vitality. 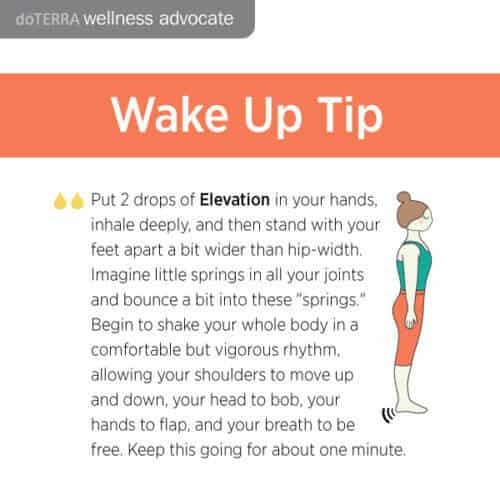 Not only does Elevation have powerful benefits for mood, but its aroma will bring a refreshing scent whenever it is used. Elevation is composed of essential oils from flowers and citrus fruit, and its sweet and floral fragrance reflects its plant origins. The aroma of Elevation blend is also energizing. Create your own positive environment when you use Elevation. This blend is called the joyful blend due to its ability to promote a positive mood. 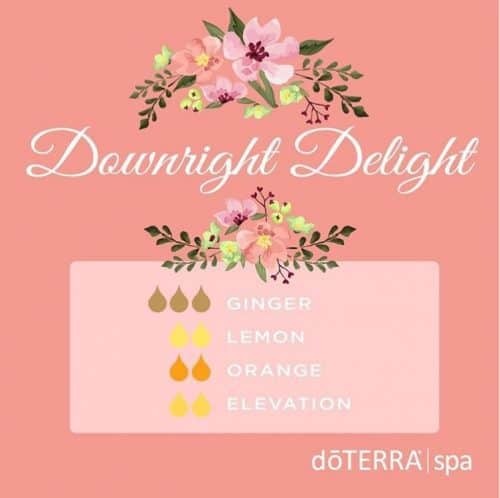 When you use Elevation in a diffuser or on your skin, it will help facilitate a revitalizing environment that will uplift and help you relish the joys of life. Don’t let the stress and nerves of an upcoming interview intimidate you or keep you from being your best self—use Elevation instead. Before an interview, diffuse Elevation to promote feelings of confidence and self-worth. You’ll walk into that interview confident in the unique and strong person you are. Feel empowered and ready to take on the day by applying Elevation blend topically. For quick results, rub elevation oil blend over your heart, temples, or wrists to elevate mood and promote vitality. This simple application can be done at any time of the day for a quick pick-me-up. Waking children and teenagers up after a night’s sleep can sometimes prove to be a difficult task. All too often, the groggy awakening after a deep sleep casts a shadow of negativity over the morning. 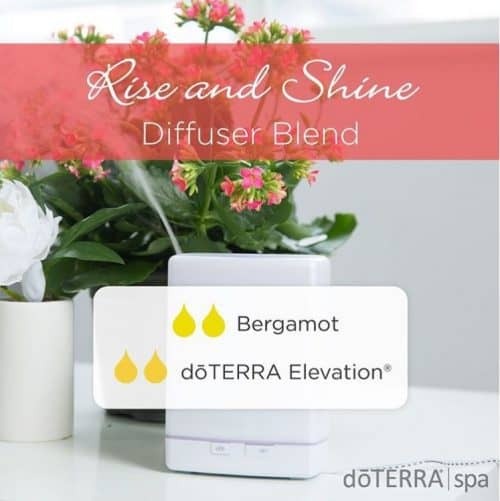 To help your children wake up in a happier state, diffuse Elevation in the mornings before waking the kids to create a positive and energized mood. When the stresses and tasks of the day seem to be looming over you, make sure to step back and take a well-deserved break, or better yet, a warm bath with Elevation. For a relaxing experience, fill your bath with the desired temperature of water and add a few drops of Elevation for a restful, uplifting experience. 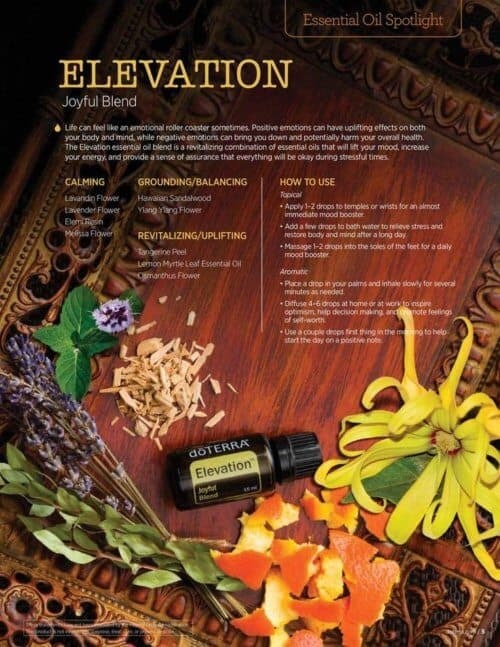 Elevation will help lessen feelings of stress and will help create an uplifting atmosphere. Elevation is a choice essential oil blend for diffusion. If you are in need of a self-esteem boost or are wanting to lessen feelings of stress, now is the perfect time to pull out your diffuser and start diffusing Elevation. To promote feelings of self-worth while also reducing feelings of stress, add three to four drops of Elevation in the diffuser of your choice and diffuse. Do you tend to get stressed when addressing large groups or audiences? Reduce the stress you feel with public speaking by using Elevation before your big moment. Simply diffuse Elevation or apply Elevation topically for fast results. Elevation will help lessen feelings of stress so that you can publicly speak without unnecessary emotions getting in the way. 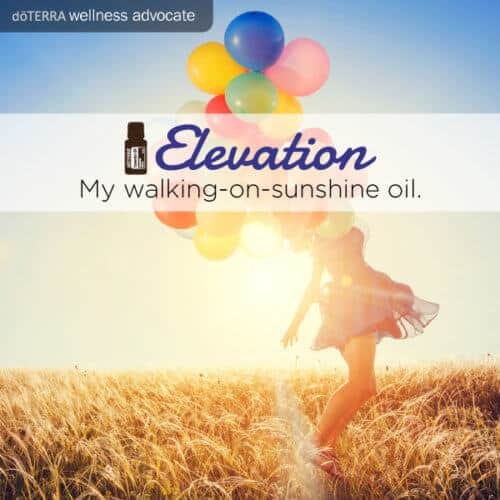 A positive mood can go a long way; that is why Elevation is an important blend to have on hand. 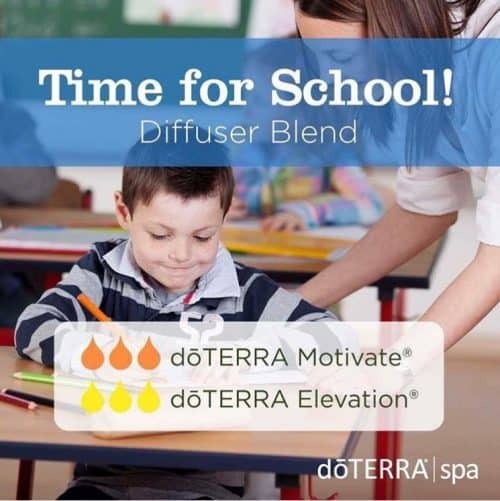 When you need more confidence due to experiencing a difficult transition, teaching a challenging subject in a classroom, or seeking a more positive atmosphere in the home, diffuse Elevation to promote a positive mood and increase feelings of confidence and self-worth. 9. Get Up and Go! Start your weekend feeling invigorated with essential oils! Diffuse one or a combination of the oils listed below to help uplift your mood and energy levels. Stay in this weekend and enjoy a spa-like atmosphere with this Spa Elevation diffuser blend. « Why is doTERRA So Expensive & Why Are Other Essential Oils Cheaper? That sounds interesting – I could use some of that! I’ve tried a couple of doTerra oils and I enjoy the smell of some but am still in that skeptical state… It does amaze me how far away we are from natural solutions in our society! Thanks to your post, I finally ordered Elevation! I want to be nicer to my kids as well! Thank you for this post. I found it by searching to see if I needed to dilute elevation. Now I know how to use it, thank you!